After my time in Uluru, I return to practice in the city where life is conducted discreetly, where emergency services screen the ugly and the violent from us good citizens, and life feels normal again. Here the tragic is not the rule. Half a year later, I am ready to work again in a remote community. I fly to Halls Creek in the Kimberley, dimly aware that the town is said to be ‘troubled’. As I board the plane, the hostie hands me a morning paper. Headlines leap out at me, reporting an alarming increase in youth suicide in the outback, especially in the Kimberley. 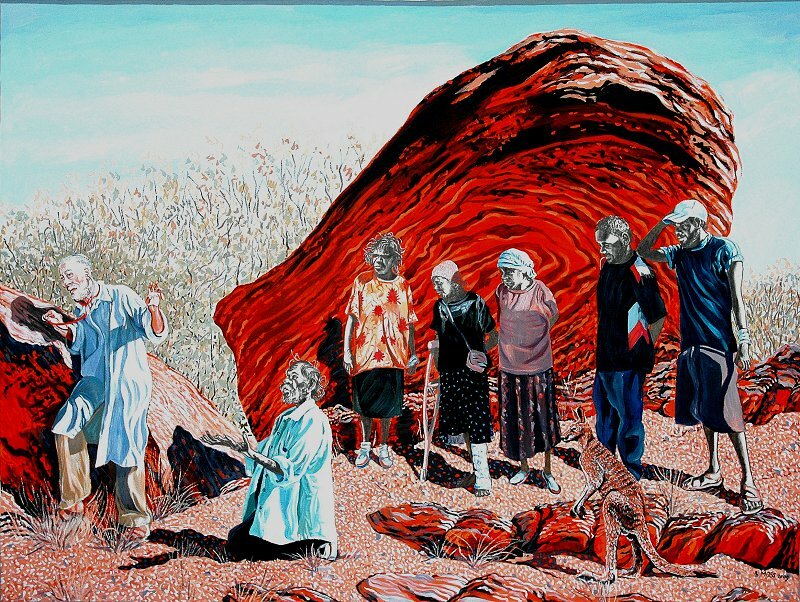 When I arrive in Halls Creek I am greeted by a passing parade of silent figures, most of them too thin or too fat, floating noiselessly like spirits along the streets of their own town, as if they have no right to be there. Or no right to be heard. At night, it is the opposite: the people are heard, but dark-skinned in the moonless dark, not readily seen. They cry out hoarsely, harshly, sounds of abuse, the odd scream, cries punctuated by peals of riotous laughter. Late at night, sober people do not walk the streets in Halls Creek. I go to work in the clinic. My patients seem to fall into two categories – those who are wrecked but salvageable and those who are wrecked, whom I cannot redeem. I work hard with members of the former group. Bare feet have been nicked by a bindi eye and have become infected. Scabies have been scratched and infection has entered. A small cut on a child’s palm is infected. At every infected site pus gathers. Where infection is deep set, the pus is trapped and it is my job to release the foul fluid. It pours, it bursts, stinking into freedom. The smell lingers in the air. My patient feels relief and I, little relieved, bandage the foot, the hand, the leg, and send it out to become infected again. And turn then to the unredeemed, to the old ones. A ravaged woman, thin, hobbling on the arm of her stronger sister, her mind seemingly destroyed along with her body, is unable to recall how old her baby is. Her file tells me she is thirty-one years of age. After two days at work in Halls Creek, I have contracted an insidious condition that is rampant in the town. Apathy and acceptance, braided into a noose, rest around the neck here. Slowly, it tightens into a passivity that numbs and deadens. I have never before been afflicted in this way. You can get the papers here, one day late. Page after page is full of gloomy reports of the Aboriginal condition, page after page of relentless criticism of the industry in which I work as a reliever for a palliator. And although Halls Creek is a town of only 1800 souls, the name appears with surprising frequency on the pages of this Perth daily. Halls Creek appears to be proverbial for all the things that have gone wrong, everything that has been done, everything that has been done wrongly, everything that has not been done. The paper arrives twenty-four hours late, but it makes no difference. Not until Thursday 21 June 2007. That is the day when the Prime Minister shakes off his own passivity and declares martial law against child abuse in the Northern Territory. I feel confused. I am not surprised to find myself deeply ambivalent about these brave, bold, brash initiatives. For anyone with any humility, confusion is morally mandatory in Aboriginal matters. And confusion is, of course, quite useless. But no one else I speak to seems confused. Among people who are not customarily supporters of the Prime Minister, minds are quickly made up: it has to be done. Today is Friday. There are new regulations in Halls Creek that restrict the sale of grog. You can’t buy alcohol before midday and you aren’t allowed to buy more than a dozen cans of full-strength beer. A few minutes after noon I pass the bottle shop as a stream of people snakes along the road. The new grog regulations are taking effect – everyone carries the identical purchase; everyone has bought the maximum. Early this evening there will be a footy match in town. There is a mob coming from near the Northern Territory border to play the local team. (I try to imagine Collingwood going to play in Sydney – the whole team driving both ways. Next weekend, the home teams will drive similar distances for their away matches.) Here is an opportunity to see something distinctive, an exhibition of gifts in full and exuberant flower. Aboriginals playing footy are not known for passivity. I decide to walk the 150 metres to the town’s floodlit oval. An emerald of green, it shines in the light, a reminder of how grass used to look in the country towns of the Garden State. Although it is only 6.00 p.m. the town is dark and drunk and very easily audible. At the corner of Hall Street and the Northern Highway, a man urinates against a fence. At the next corner a woman stands beneath a street light, her shirt undone, her breasts fully exposed to view. She stands there, more or less steadily, her back braced against the fence, facing the street. Is she offering herself for sale? Or is she available free of charge? Or is she simply too drunk to achieve the buttoning of a shirt, or just unconscious of her exposure? The night is rent with the cries of kids, the screams of women, the hoonish menace of daylight’s shy youths as they bay now in groups to an unseen moon. I never make it to the footy. After a few minutes I turn and retreat to my house, to the peace and sweetness of shabbat. Elegy on Returning to Mutitjulu. You’d be twenty one now. Probably a mother, perhaps once, twice, three times. I wonder about your children. Whom would they be? And about the lonely impulse of despair that drove you out of the house into the bush with the rope. So many have followed you, so many brothers, many sisters. One in grog rage, one in madness; this one in anger, that one in sadness, this one over a woman, that one whose father shouted. So many, in so many places, so many have I buried. You were the first, your buck teeth like my sister’s when she was fifteen. You were the first I lost. The first part of this piece is taken from Raft by Howard Goldenberg, Hybrid Publishers, 2009. The second part was written today by Howard in Uluru. I remember that part about the girl in your book Howard, I was glad to see this afterword you wrote and that you also remember her six years later.